I believe in the mantra, "Power to the people!" I also believe that all pre-lawyers should have good, accurate, and FREE information for crafting their best possible law school application. Before you go any farther, save and print out our FREE Personal Statement Packet. It’s helped thousands of people write great personal statements and diversity statements, and it can help you too. In case you’re wondering about the logos in the videos...yes, Prelaw Guru used to be called The Personal Statement School many moons ago. How and when do I apply to law school? How do I find out if I want to be a lawyer? The legal profession is not one to enter lightly. It’s often a commitment of hundreds of thousands of dollars, three years of hard work, and many years of personal and professional sacrifice. 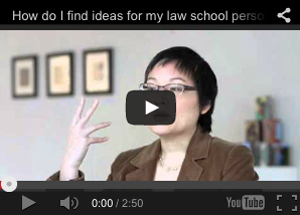 To learn how to explore the legal field, watch this video. Back to top. I just started college. How do I prepare for law school? 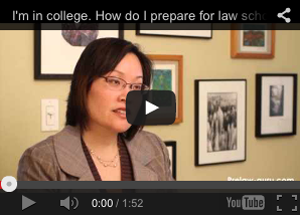 Whether you just started college, or have been there for a while, watch this video for two major pieces of advice on preparing for law school. Back to top. I’m not sure if I want to go to law school right now. How do I decide? 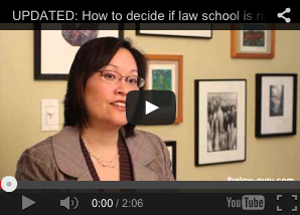 Watch this video, then read Ed Tom’s Top 10 Questions to Ask Yourself Before You Go to Law School. Ed is the Dean of Admissions at Berkeley Law. He’s been in this business for over 25 years. The man knows his stuff. Answer his questions with brutal honesty. Back to top. Watch this video for valuable LSAT prep advice that I learned over the years from successful LSAT test-takers. Back to top. Watch this video for more helpful LSAT prep tips and an inspiring LSAT success story from one of my students. Back to top. You apply to law school in the fall, about one year prior to admission. For example, if you want to attend law school in the fall of 2017, you would apply in the fall of 2016. I recommend that you write your personal statement, resume and other materials during the summer and early fall, and then apply to law schools in October and November. At the latest, apply by December. At the very latest (if you are waiting for a December LSAT score), apply by mid-January. Why apply in the fall when most deadlines are in the spring? Because if you apply in the spring, your application will be LATE. Many admissions decisions and scholarships will have already been sent out. Do not wait! Apply in the fall! To keep yourself on track, print and follow my Law School Application Timeline. If you find this timeline helpful, check out The No B.S. Guide to the Law School Application Timeline for more detailed tips and advice. Back to top. What is the biggest mistake people make on their law school application? It makes me so sad seeing law school applicants make the same mistake every year. Watch this video to figure out how you can avoid making the mistake that so many applicants make. Back to top. Why is the personal statement so important to the law school application? Watch this video to find out why it is incredibly important to spend time writing a stellar (not okay or good) personal statement for your law school application. Back to top. First, read this one-page Law School Personal Statement Tip Sheet. This tip sheet will help you understand what to do and what not to do when writing your personal statement. Thanks to Traci Howard and Karen Clemence for their excellent tips. Next, read this 16-page Law School Personal Statement Packet. The packet contains seven personal statements and four diversity statements from real students that Chanira Reang Sperry and I worked with when we were prelaw advisers at the University of Washington. All of these students were admitted into great law schools and many received scholarships too. Print out and read each of the statements twice. The first time, just read the statement. The second time, pay attention to the values and lessons learned by each applicant and write them down. Also, notice how each applicant structured his or her statement. Understanding how these students wrote their essays will help you to write your own. For more help, I recommend checking out my Write Your Personal Statement in 7 Days online class. Back to top. I have a boring life. What do I write about? If you think you have a boring life and have no hope for writing an interesting law school personal statement, you should absolutely watch this video. Back to top. How do I find ideas for my law school personal statement? Everyone has stories--many of them, in fact. Asking yourself open-ended questions and writing down your answers without judgment and without editing yourself is an effective way to unearth the stories that reside within you. Watch this video to learn more. Back to top. I read the Personal Statement Packet and I don’t have a tragic story to write about. Now what? If after reading the packet you think that writing a great personal statement is only about having a tragic life story, you are missing the point. Watch this video and then go back and read the essays again. You will see that lessons can stem from all kinds of experiences, not just negative ones. 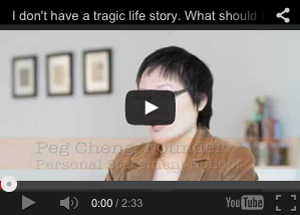 Experiencing tragedy is not a requirement for writing a great personal statement. Back to top. How do I write a law school diversity statement? One of the most overlooked parts of the law school application is the diversity statement. Watch this video to figure out if you should write one. Back to top. How do I write a law school addendum? You should write an addendum--a separate, short essay--for weaknesses in your application like a low LSAT score, low grades, withdrawals from classes, a leave of absence and more. Watch this video for more details. Back to top. How do I write a Criminal Record Addendum? When it comes to having a criminal record, you should disclose. When in doubt, disclose. Watch this video for details. Back to top. Are optional essays really optional? Most of the time, optional law school application essays are only optional if you do not want to get into that law school. But in some cases, "optional" can actually mean optional. Watch this video for more details. Back to top.